The Galaxy Watch Active is gorgeous, but misses the mark in a few key areas. When Samsung announced the Galaxy Watch Active smartwatch at its Unpacked Event a few weeks ago, I was cautiously optimistic. Sure, it did away with the company’s signature rotating bezel, but otherwise, it was sleek, had all the right specs, and honestly, Samsung has consistently put out some of the best Android-friendly smartwatches over the past few years. It just always seems to struggle with the leap from pretty good, to really great. Gorgeous design. Lightweight. Good price. Mixed accuracy. RIP rotating bezel. Whatever else you want to say about the Galaxy Watch Active, this is a bee-yoo-tiful smartwatch. The 1.1-inch, 40mm AMOLED circular screen didn’t overpower my lady wrist, which is a problem I run into a lot. For instance, the smaller version of the Galaxy Watch is still 42mm and while it looks nice, it was still somewhat bulky and heavy. Not so with the Active. It’s light enough that I barely notice it unless I’ve got it strapped on too tight. Color wise, it’s also got some attractive options in black, silver, rose gold, and green. I opted to test the rose gold version, because why not, and also to see how it stacked up against some other fashionable, Android-friendly watches. Compared to the Fossil Sport, the Active just has a sleeker profile and it’s a bit more comfortable as the two buttons on the right side don’t protrude quite as much. Side-by-side, the Active looks a bit thicker, but it also looks less chintzy—the Sport’s nylon case really doesn’t do it any favors. Meanwhile, the Misfit Vapor 2 is heavier, and has more of an industrial look overall. 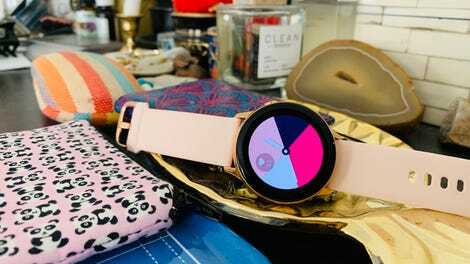 But where I could see the Fossil Sport and Misfit Vapor 2 working as unisex watches—even in rose gold—the Galaxy Watch Active might just be the first smartwatch that’s better suited to women. Left to right: Fossil Sport, Samsung Galaxy Watch, Misfit Vapor 2. A trio of watches that are pretty in pink. There are two reasons for that. First, the small case size is great on petite wrists but might look downright tiny on larger wrist sizes. Second, Samsung got rid of the rotating bezel. As much as it made Tizen stand out by being the most intuitive of smartwatch operating systems, it did give all of Samsung’s wearables a distinctly masculine vibe. 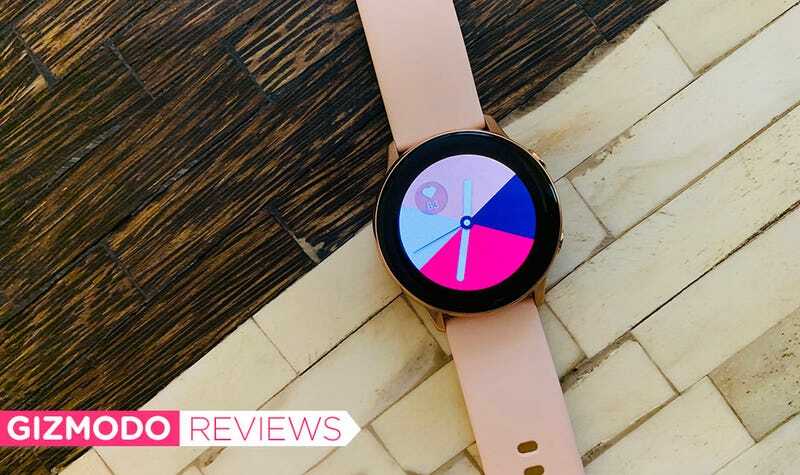 If anything, the photo above proves that by getting rid of it, the Galaxy Watch Active is looks just as sophisticated, if not more so, than some of the best-looking smartwatches out there. That said, nixing the rotating bezel doesn’t mean the Galaxy Watch Active doesn’t have one. It’s frustrating, but there is a thick black ring around the Active’s display. It’s not as egregious as say, the border on the Fitbit Ionic or even on the Versa—most of the screens and widgets utilize a black background to mask that it’s even there. It just highlights the fact there seems to have been plenty of room for the rotating bezel that could have been. Does Tizen actually suffer though? Surprisingly, not really—there’s just a lot less to differentiate it from Wear OS right now. But in terms of performance, it’s quite snappy, and swiping between screens is fast and easy. You swipe left to view notifications, right to scroll through pre-set widgets (of which, Samsung has provided plenty), and down to view a quick settings menu. Pressing down, meanwhile, will let you choose between Samsung’s preloaded clock faces—which for me, were varied enough to find one I liked. That said, Tizen isn’t quite as stacked when it comes to available apps as, say, the Apple Watch. Plus, it doesn’t matter how hard Samsung tries—Bixby just isn’t good and it’s not happening. Wireless Power Sharing via the Galaxy S10 is cool, but doesn’t take the sting out of a 2-day battery life. The Active does decently well on battery life as well. Samsung estimates about 45 hours with “typical usage,” and that about tracks if you keep continuous heart rate monitoring on. (You can get a bit more mileage if you go into settings and opt for more intermittent heart rate readings.) The most I got with the Active was roughly two full days, including one night of sleep. I gave it a quick juice before sleep tracking the next night, and 50 percent battery was enough to get me through to the next morning. Two days isn’t great per se, when you consider the Fitbit Versa gets about 5 days on a single charge and the Galaxy Watch gets a superb 4-5 days depending on which version you get. But it’s roughly the same amount you get with the Apple Watch Series 4, and given the compact design—forgivable. To take the sting out of the two-day battery life, Samsung says you can wirelessly charge the device via a Galaxy S10 phone. And that is cool—kinda. It just requires that you’re already in the Samsung ecosystem, have an S10, and don’t mind incapacitating both your phone and watch while it charges. I tried it out and the Wireless Power Sharing feature definitely works—it’s just not fast and you do need to position it in exactly the right way to keep it charging. At the end of the day, the idea of waiting 58 minutes with my phone face down to charge 38 percent seems more of a gimmick than practical. The hardware and sensors on this baby are solid. Adorable Yorkie not included. On a one-mile treadmill walk at 3.5 miles per hour, the Galaxy Watch Active tracked 1,705 steps compared to the 2,126 steps logged by my control pedometer, the Yamax SW-200 Digi-Walker. That’s a cringe-worthy difference of 19.8 percent. Running didn’t fare much better. A one-mile run at 5mph resulted in 1,664 steps to the Yamax’s 1,951 steps—a difference of 14.7 percent. That’s also not great. Generally, most fitness trackers and smartwatches I test tend to be somewhere in the 2-5 percent range. For instance, I tested the Fitbit Ionic Adidas Edition at the same time and got much more accurate 1.08 percent and 1.03 percent differentials for walking and running, respectively. The only time your heart rate should be a static line is if you’re dead. When it came to heart rate, the Active did somewhat better. During mid-run checks, it was within 5 beats per minute of my Polar H10 chest strap. It was also roughly on par with the Fitbit Ionic Adidas Edition. That said, on a separate, open-ended 17-minute interval run, I encountered an odd glitch. The watch just could not get a read on my heart rate at all. The entirety of the run was recorded as a flat-line 120 beats per minute, which I know to be untrue because: 1) the only time your heart rate is static is when you’re dead; and 2) I have data from other trackers worn simultaneously that prove otherwise. None of this gave me much hope for the watch’s blood pressure monitoring feature. The company was suspiciously silent about it at the Unpacked event, and for good reason. It requires a separate app—My BP Lab 2.0—which launched late on March 15 and did not seem to meet some consumer expectations if reviews on Google Play Store are to be believed. The app itself also requires users to take an initial reading via a traditional blood pressure cuff before it uses the optical sensor to measure your heart rate and stress levels to monitor readings going forward. It’s not exactly fair to ding Samsung on that, however, as the company has been transparent about the feature being part of beta research and not a full-blown, FDA-cleared blood pressure monitoring tool. Look at dat fat, fat bezel. The good news is a lot of these issues are software related, and there’s a chance that Samsung will push out fixes to make the Galaxy Watch Active a more consistent health wearable in the next few weeks. If it can manage that, then the $200 Active is an excellent buy. The GPS-only Apple Watch Series 4 costs twice as much, and in terms of design, the Active is just way more appealing than Fitbit’s Versa. Tizen, even with its slightly scantier app offerings, delivers a better OS experience than Google’s Wear OS. So honestly, if health tracking takes a backseat, the Active is still a decently good option. Most of my beef is that it could have been a great one. Beautifully designed—so much so you can forgive Samsung for nixing the rotating bezel. Battery life is merely okay at 2 days, but the wireless power sharing with the S10 is a neat if gimmicky feature.